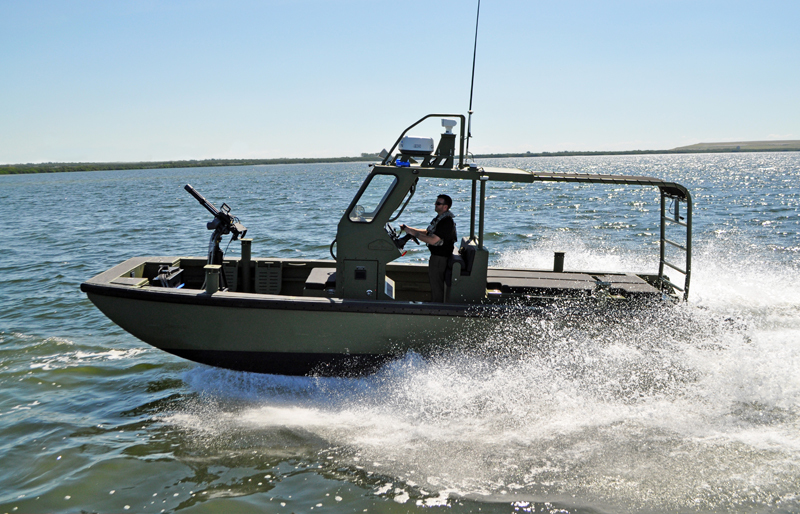 The Metal Shark 24 Riverine is a rugged and reliable shallow-draft patrol boat specially designed to withstand harsh operating conditions. 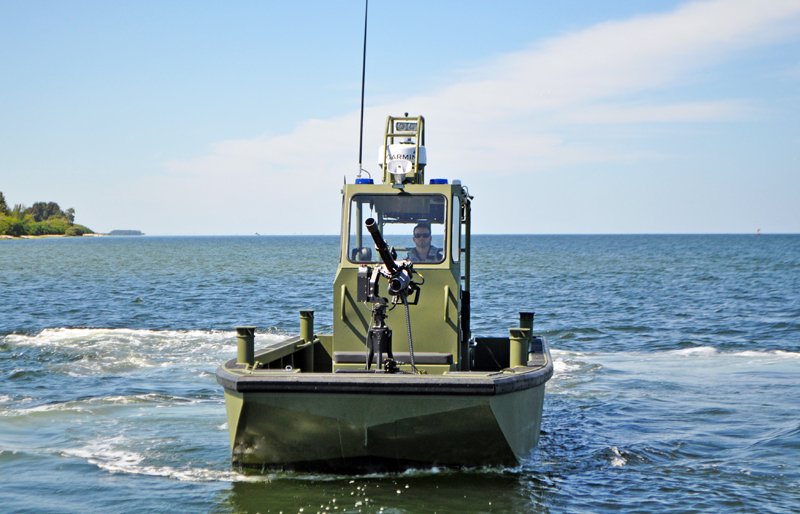 The vessels featured here are produced for US Department of Defense CNTPO contract customers and are currently deployed to multinational forces in Latin America on border patrol and counter narco-terrorism missions. 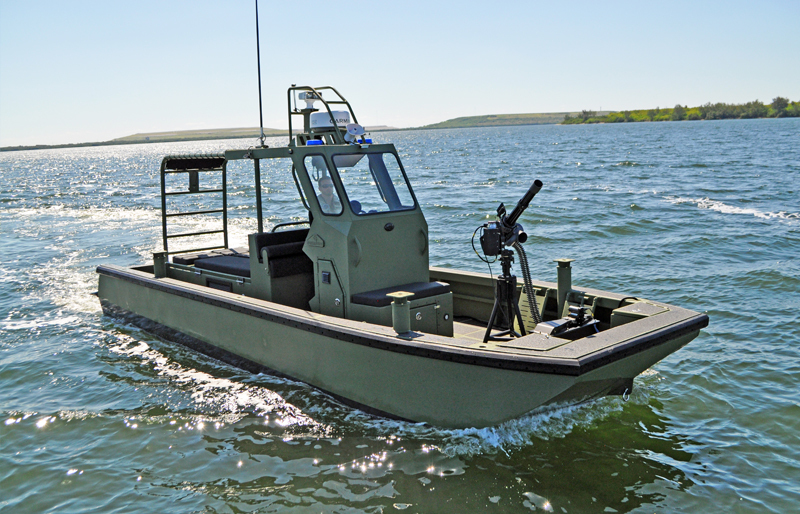 The 24 Riverine is shown here equipped with four perimeter gun mounts and bow tripod supporting a Dillon Aero M134D minigun. The vessel can accommodate a crew of 12+, with seating for ten aft of the helm and flip-down forward seating available. The vessel shown here features a dual purpose canopy that provides weather protection as well as secure aft-deck hand-holds. 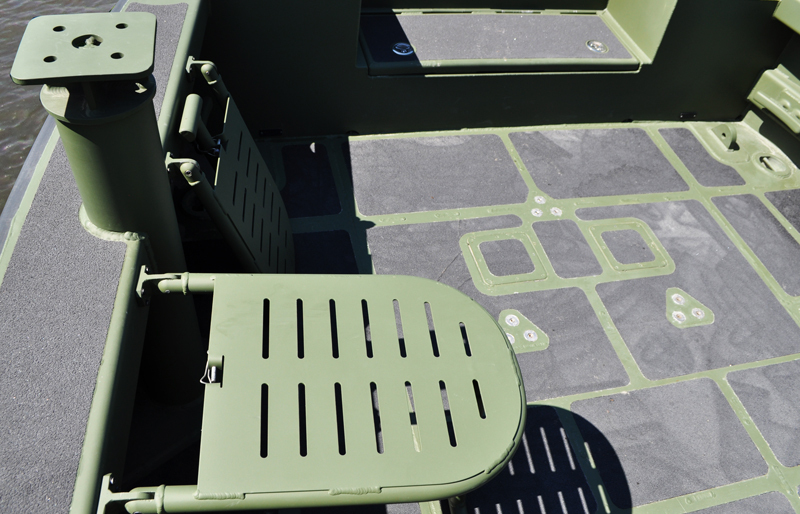 An integrated forward boarding step allows for quick, surefooted access during landing operations. Low-level LED lighting discretely illuminates walkways. 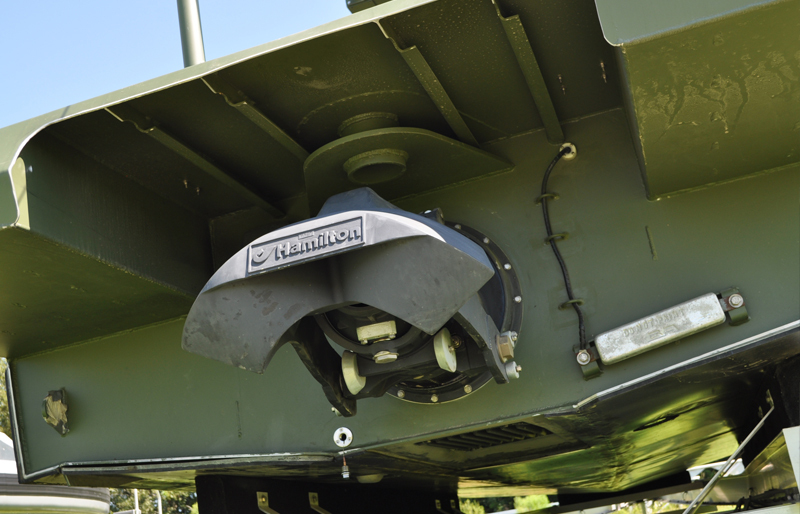 A full-width transom swim platform allows for easy self-recovery, with a removable dive ladder that stows securely when not in use. A bench helm seat features a flip-up bolster to allow for easy operation while seated or standing. The aft cockpit features padded bench seating for up to eight. The rear port and starboard gun mounts are situated within easy reach of crew seated on the aft benches. A padded two-person bench seat is integrated into the forward console. Additional fold-away seats may be added in the forward cockpit for total seating of sixteen. 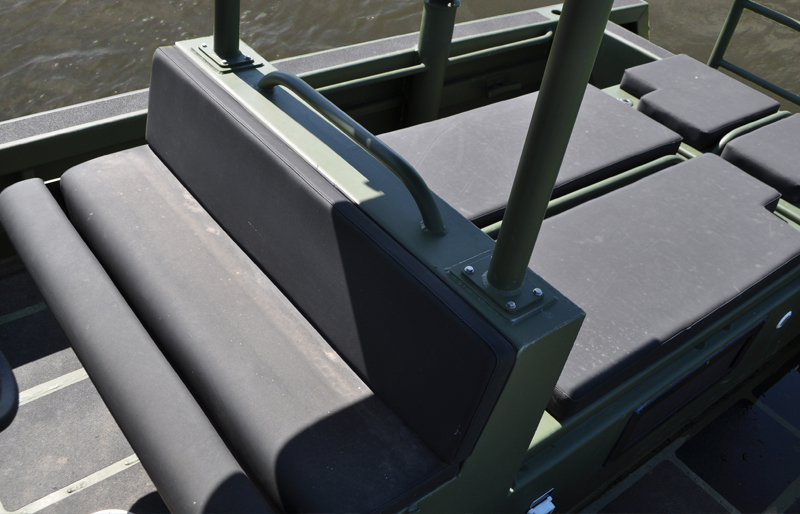 In inboard configuration, the 24 Riverine’s engine, gel cell batteries, and battery selector switches are located in a roomy engine compartment equipped with sound reduction panels. 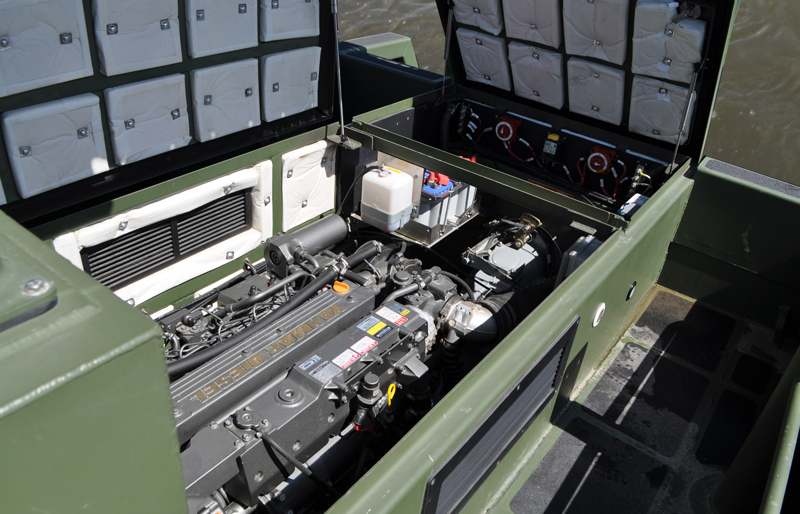 The engine compartment is easily accessed beneath the cockpit bench seating, facilitating maintenance and significantly reducing down-time during service periods. The 24 Riverine is shown here equipped with a Yanmar 415 HP diesel engine and Hamilton 274 jet drive with built-in cooling and a hydraulic thrust-reversing bucket. 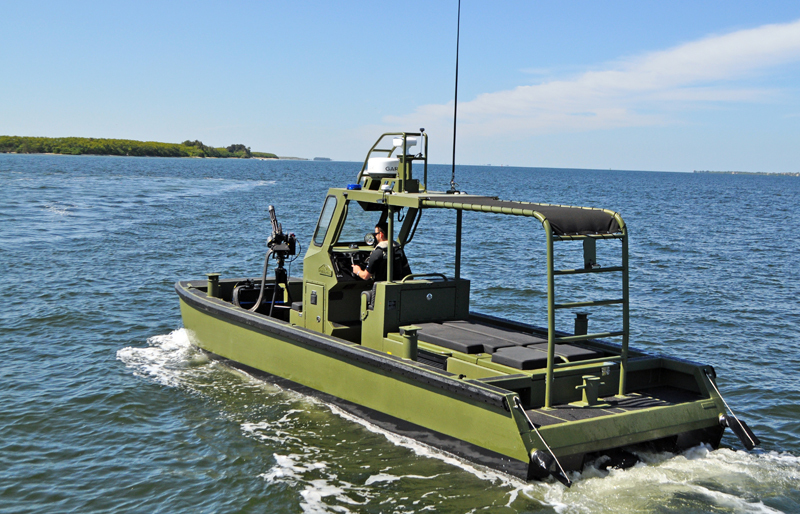 The combination of hull form and engine/drive selection allows the 24 Riverine to perform in less than 18” of water, while providing unsurpassed maneuverability and impact resistance. As a fully custom builder, Metal Shark can custom-tailor the 24 Riverine platform to accommodate various different propulsion types to suit mission needs or fleet commonality requirements. Outboard power is also offered. 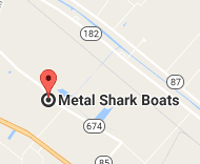 For more information about this or any other Metal Shark model, contact us today.